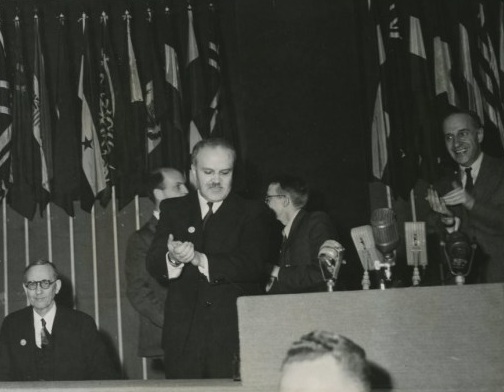 Speech delivered at the extraordinary eighth Congress of Soviets of the USSR. The strength of socialist democracy lies precisely in the fact that, having arisen as a result of the victory of the proletarian dictatorship, it is growing and expanding day by day, particularly with the growth of culture among the masses. And this reflects the mighty growth of our strength. After the complete victory of socialism in our country the democracy of the Soviet system is developing with greater force and on a wider scale than ever; and, in its turn, it serves as a powerful lever for the further acceleration of the growth of the forces of socialism. The development of democracy in our country reveals the superiority of socialist democracy over the democracy of bourgeois states. But here I must make a slight digression and deal with a very peculiar form of “democracy”, that of German fascism. That is why all the Nuremburg congresses are so unlike real congresses. They are-not congresses but something else. A comparison between Soviet democracy and the democracy .of bourgeois countries, even in its best forms, reveals the radical difference between them and the superiority in principle of the former over the latter. One thing is clear, and that is that socialist democracy alone is democracy for the toilers, democracy for the real masses of the people who have emancipated themselves from the rule of the exploiters. Today all this belongs to the whole people. What more consistent democracy can anyone desire? Let any other state introduce such measures. If it does we shall admit that the democracy of that state is genuine, universal democracy, such as the democracy in the U.S.S.R. The new Constitution now gives all citizens of the U.S.S.R. equal rights. It may even be said that the former property-owners have returned-although in a special way-to the administration of property. But today, in taking part in this work through the medium of the toilers’ Soviets, they have become immeasurably richer, for they are now taking part in the administration not of private property but of the property of the whole people. We would like to see any bourgeois state, transferring to the peasants without compensation; not 150,000,000 hectares, perhaps, but only 15,000,000 hectares of landlord and other land. We would then be prepared to admit that such a state was beginning to make a serious approach to the position of real democracy, democracy for the toilers. And yet, somehow, we do not hear that the landlords, the nobility and the monastic hierarchy, consider, from their class point of view, this transfer of land to the peasants to be “democratic”. It must be admitted that revolutionary democracy is alien to them. In 1917, Socialists such as the Socialist-Revolutionaries and the Mensheviks were in power in our country. Everybody knows that they did not use their power for the purpose of transferring the land to the peasants, but for the purpose of procrastination in this matter. Here, too, they proved to be the direct allies of the landlords and the bourgeoisie. And yet, how they boasted about their devotion to “democracy”! Hence, in our times, Menshevik and Socialist-Revolutionary “democracy” plays into the bands of the capitalists, landlords, kulaks, nobility and the priests. Hence, “democracy” as conceived by the Mensheviks and Socialist-Revolutionaries has nothing in common with genuine democracy, which the people need so much. One other example of Soviet democracy. The celebrated author A. N. Tolstoi spoke here, just before me. Who does not know that this is ex “Count Tolstoy? And now? One of the best and most popular authors in the Land of Soviets is Comrade Aleksei Nikolaevich Tolstoi. `History is to blame for this.’ But the change was in the right direction. On this all of us, including A. N., Tolstoy himself, are agreed. The new Constitution will consolidate our profoundly democratic system more than ever. And by the fact that, side by side with the distinct reference to the definite duties of the citizens of the USSR, it firmly guarantees such right as the right to work, the right to rest and leisure, the right to material security in old age, the right to education, complete equality of rights for men and women, complete equality for the nations and races in the USSR etc., we loudly proclaim how socialist democracy should be interpreted. Even the most perfect forms of democracy in bourgeois states are in reality very restricted and tightly compressed within the limits of what is actually the rule of the bourgeois minority over the people. No form of democracy under capitalism extends, nor can extend, beyond the limits of the rule of the privileged minority of the bourgeoisie; it fits the rights and liberties of the people to the hard bed of Procrustes. With the aid of its ideologists and its press the bourgeoisie succeeded in acquiring for wretched capitalist democracy, the democracy of ‘the bourgeois states, fame as democracy in general, as the “above-class” form of democracy, and even as the “human” form of democracy. In this respect the dexterity of the bourgeois and Social-Democratic politicians and “theoreticians” has been brought to the perfection of that of a juggler. In actual fact, however, not a single bourgeois state grants, or has ever granted ‘the toilers, even a fraction of the genuine democratic rights and liberties which are enjoyed by the toilers of the USSR, and which they will enjoy to an even greater degree under the new Constitution. In the guise of “people’s democracy”, bourgeois democracy eulogizes what at best, are the extremely, restricted and extremely curtailed rights of the toilers under the bourgeois system, under which the press, the print shops, printing paper, premises, all the capital and all the power, and hence, actually all rights, belong to the ruling classes. The toilers merely get the crumbs from the rich man’s table. Nevertheless, the workers and the other working strata of the population have learned to use even these “curtailed” bourgeois liberties, even these restricted democratic rights in their own interests for the political enlightenment of the masses, and for the preparation of the forces necessary for the impending battles. One can understand, therefore, why. the workers, and all democratic elements in capitalist countries, are waging such a determined struggle to preserve, and to enlarge, even minor bourgeois-democratic rights and liberties. Is it surprising, therefore, that not only the workers and peasants but all honest democratic elements among the petty bourgeoisie and even among the middle bourgeoisie more and more openly refuse to support fascism and fascist-inclined groups? The rapidity with which the pillars of fascism are being undermined is evident from a number of facts. Not only do the fascists today refuse to tolerate any survivals of democracy, in their own countries, where, as it is, the people, are “silent, for they prosper”, but, it is characteristic that they regard the very existence of democracy, even democracy in other countries, as a danger to themselves. Our attitude toward democracy as one of the most precious boons to the toilers is well known. The successes of democracy in any country are near and dear to us. We rejoice when democratic rights are won no matter where the masses of the people are marching, forward, along this road. The adoption of the new Constitution will further enhance the significance of the USSR as the bulwark and beacon of democracy. The adoption of the new Constitution, with its complete democratization of the state, which increases the possibilities of achieving further and still greater success in improving the life of the peoples of the USSR will render invaluable assistance to international socialism, and will give an impetus to the struggle of the workers, peasants and all the oppressed for their rights, for their complete emancipation from fascism, and from capitalism, which engenders and fosters fascist regimes. The more deeply the Stalin Constitution permeate our lives, the more widespread will be its influence as the, Constitution of socialism and of consistent democracy, not only in the USSR, but far beyond its frontiers-and the wider will its revolutionary influence spread among the masses of the toilers who are fighting for their emancipation from fascism, imperialism and colonial oppression.